Chimney Rx Brushable Crown Repairs is for masonry chimney crown repair repairs and protects your chimney crown from water intrusion, cracking and deterioration. DEFY Brushable Crown Repair is a fast setting elastomeric coating that forms a flexible waterproof membrane. It's specifically formulated to repair and protect chimney crowns from water intrusion. It stops leaks and prevents cracking and deterioration of the crown. DEFY Brushable Crown Repair is a masonry chimney crown repair product that is easy to apply with a 3" or 4" paint brush. It's very durable and requires no mixing or special bonding agents. The compounds are all solvent-free and will not harm the environment. Use this product wherever a long lasting exterior waterproof membrane is needed, such as masonry chimney crowns, chimney corbels, tops of masonry or parapet walls. Another use is for masonry window sills where bricks are laid in a soldier pattern at the base of the window. 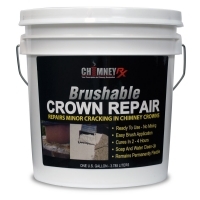 DEFY Brushable Crown Repair can be custom colored with small amounts of standard mortar dye. The major benefits of DEFY Brushable Crown Repair are its unique water based quick dry technology and its great coverage rate. The product completely cures in 2-4 hours depending on the temperature and humidity. The coverage rate is approximately 40 square feet per gallon. From James Garner of Buena Vista, Georgia on 11/28/2015 . From Anonymous of Lynn Haven, Florida on 10/24/2015 . From Anonymous of Statesville, North Carolina on 7/8/2014 . From James Hatfield of Douglassville, Pennsylvania on 9/4/2013 . From Anonymous of Ashland, Kentucky on 7/13/2013 .